You’ve found the perfect item (say, a really classy Elvis Presley wristwatch) on eBay, it’s in your price range, and you’re ready to bid. 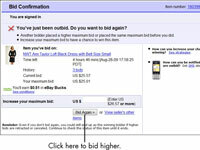 So just how do you bid on an eBay auction? 1Find the bidding form at the top of the auction listing or click the Place Bid button at the bottom of that page. 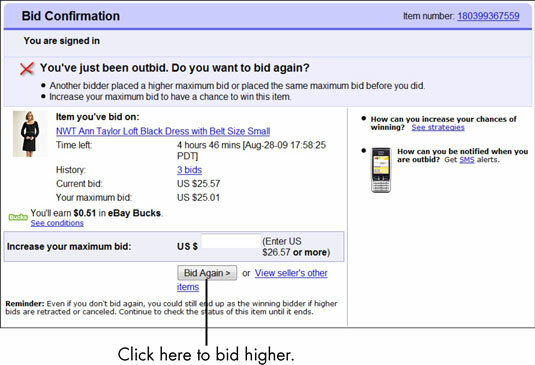 If the item includes a Buy It Now option, you see it below the bid form. 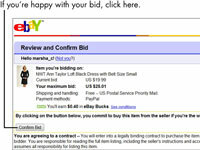 2To fill out the bidding form and place a bid, sign in to your eBay account when you log onto the site. You won’t be able to do anything as the login page will pop up automatically. 3Scroll to the bid form on your selected item’s page and enter your maximum bid in the appropriate box. The bid must be higher than the current minimum bid. You don’t need to type in the dollar sign with your bid, but you do need to use a decimal point — unless you really want to pay $1049.00 instead of $10.49. If you make a mistake with an incorrect decimal point, you can retract your bid. 4Click Place Bid (or Buy It Now if you’re making a direct purchase). The Review and Confirm Bid page appears on your screen, showing you all the costs involved in purchasing the item and explaining the terms of the purchase. 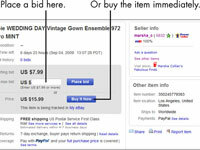 If you’re not sure that you really want the item or you don’t intend to buy it, do not bid! 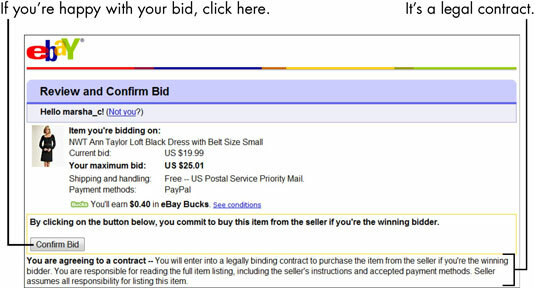 eBay considers a bid on an item to be a binding contract. 5If you agree to the terms, click Confirm Bid. By agreeing to the terms, you are agreeing to a contract . . . [and] will enter into a legally binding contract to purchase the item from the seller. In other words, if you bid on it and you win, you buy it. After you agree to the terms, the Bid Confirmation screen appears. After you click Confirm bid, you’ll see a page which will let you know the status of your bid.